Yes, another ice cream recipe! As I said, I missed the boat last year but finally bought myself the Cuisinart ICE-21 Frozen Yogurt-Ice Cream-Sorbet Maker. Now I'm making up for lost time! I normally wouldn't post two in a row, but my husband was clamoring for more homemade ice cream! For information about using the machine, see last week's Strawberry Ice Cream post. This recipe was inspired by one in the instruction booklet that came with the machine. It's an easy, no-egg, uncooked ice cream. I made a simple flavor improvement. And it is fabulous! In the coming months I'll be developing my own recipes for more uncooked ice creams like these as well as custard-style ice creams, frozen yogurts and sorbets. I'm so excited! It's wonderful on its own, but if you want a summer dessert that'll make people stand up and holler, put a scoop of this on the plate next to a wedge of Peach Pie with Lattice Crust! Can't wait for peach season! 2 At least an hour before making ice cream, melt the butter in a small skillet (I use the All-Clad Stainless 8-Inch Fry Pan) over medium-low heat. Add pecans and salt. Cook, stirring frequently, until pecans are toasted, about 6 to 8 minutes. Set aside to cool completely. 3 Assemble the Cuisinart ICE-21 ice cream maker; turn it on. While it is running, pour the chilled mixture through the spout. Let mix until thickened, about 10 to 15 minutes. 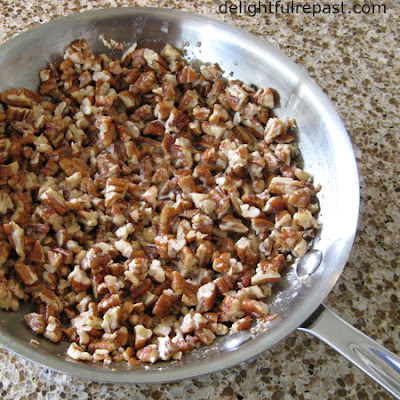 With it still running, pour the toasted pecans through the spout and let mix in completely, up to 5 minutes. 4 Transfer the soft ice cream to a freezer-safe airtight container and place in freezer for at least 2 hours. Remove from freezer 15 minutes before serving. How far are you away from Wisconsin?? The thought of warm peach pie with lattice crust and a scoop of homemade ice cream makes me hungry - and I just had breakfast! Your food photos are wonderful, Jean! Thanks, Judy! I'd love to feed you pie and ice cream, 'fraid the ice cream would melt by the time I got it there though! Sully, I thought these ice cream posts would meet with your approval! I've heard about your microwave de-bricking, but I don't recommend it for people like myself who aren't heavy microwave users and so tend to pop something in there and then get distracted. I would come back to a thin liquid bubbling vigorously! "Thin liquid bubbling vigorously..." Mmmm. Hot soup! Yeah, well, we'll see what the scale says at the end of summer, Jenn! But I wish I had a bowl of this right now. I follow in my dad's footsteps on this one. His 3 favorite ice creams were; Peppermint Stick, Butter Pecan and Strawberry (only fresh will do). I too like all these as well, but Butter Pecan leads the way. I feel ice cream truly could be one of my last meals...if I had to choose right now. Did I mention your photos look great? Your critique in the mail. My fees go down with each bite! James, thank you! Appreciate all the encouragement, especially about the photos! Mary, you are so kind! I always appreciate it when such a great cook as you leaves a comment! Thanks, Lana! I'm so glad we found each other's blogs today! And I'll probably be posting a low-fat frozen yogurt soon. Have a side dish lined up for next Friday. This ice cream sounds so so so good! I love the pic! Wow...This is a gorgeous, fantastic & delightful icecream!! Thanks, Charlie! I started cooking when I was three, I think, so I love to see a young baker! Prathima, thank you. It's hard to believe something so easy can be so good! Thanks for a yummy post. I have a Cuisinart ice cream maker that I have never used, and you've inspired me to give it a try. Yum!! That ice cream looks delicious!! Thanks for the recipe! Oh Yum! Love ice-cream, especially home-made ones. I never had butter pecan ice cream, but I love butter pecan cookies, so no doubt this is delicious. Enjoy your Sunday Jean. Merlot, thanks! I hope you'll try the recipe soon and let me know how you like it! Thanks, Michael! If you like butter pecan cookies (so do I! ), you'll love this ice cream. Thanks, Grant! I think it would make a great supper! Would make some myself today, but I'm out of organic cream and my local health food store is closed for the holiday. Thanks for the warning about the machine's capacity, Jean. I will keep that in mind! Thanks, Mary! Let me know when you get one - and whether, like me, you're kicking yourself for waiting so long! Hi Jean, I just got a ice cream attachment for my KitchenAid mixer. Last week I made strawberry. I have been looking for Butter Pecan. I think this is the recipe I have been looking for. We are having a big family b-b-q at the end of the month. I have asked the family what ice creams are their favs. Most have been, so far, chocolate and butter pecan. Can't wait to try it! Thanks so much for the recipe. Thanks, Ruthann! I hope your family likes it as much as mine does. 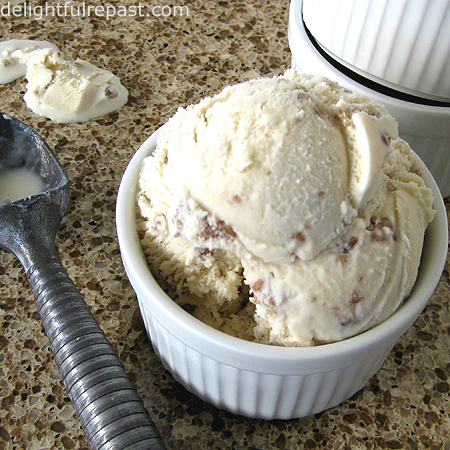 If you're like me, you're going to go crazy with your new ice cream maker--I can't stop! Come back next Friday for my easy chocolate frozen yogurt. Cindy, thank you! I haven't had a comment on this post in 5 years and haven't made the recipe in probably 2 years, then I just pulled it up this morning. Then 10 minutes later your comment came in! Tell your husband I just posted my peach ice cream and will be posting another ice cream recipe next week.